I have thought a lot, about which kind of things concerning my life on this earth may interest you. I came to the conclusion that I should mainly tell you about my life as a painter, which of course has become so important to me. If you become addicted to Goodaboom -.and naturally, we expect it! 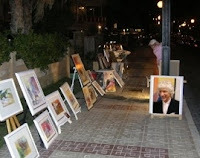 -, you will see that I exhibit every Sunday on a pedestrian street in Albir. Of course only if „el tiempo no lo impide“, if the weather doesn´t impede it, as it´s been written for generations on the famous posters announcing the bullfights. Many interesting things happen there, when I am “working the street“. As the 3 men in coats arrived, I was not present. I had to escape to my niece´s flat to satisfy a call of nature, as my usual street toilet was on that day out of commission: the door had disappeared, and it is was full of caca and the remnants of technicolor yawns! This, by the way, is one of the inconveniences of this avant garde gallery: the toilet is on the beach and principally used at night by the local heavy drinkers... Please take a moment to pity me! Anyway,... I had left Kevin by the exhibition with instructions to sell as many paintings as possible. As I came back I found him in deep conversation with a man. From a distance I saw that the man was holding something in his hands, and looking at it with great interest. I thought it was one of my small paintings and Kevin had indeed achieved a sale. But as I came nearer I saw that he was looking at one of our „Brush with Poetry „ CDs“(by the way, have a look into this page...!). I said, without paying more attention to them. I am not really a social type, and I prefer to let Kevin entertain our visitors, he masters that task fantastically, and anyway, he is my agent now! But soon the guy lost his interest in the CD and came to me. But this time nothing of the kind happened. The man looked at me intensely, insistently, as if he wanted to tell me something vital without using words. I held his stare, trying to look comprehending, but in fact without any idea as to what the silence meant. He said nothing, just continued to stare at me. In the meantime the two other men had joined us. The guy told me, that one of them was the scupltor who made the big steel anchor on the promenade, and the other one... well, sorry, I don´t remember what he was, but yes, I remember he was a funny guy with crazy hair and a gypsy look... he could have been one of the Gipsy Kings! he suddenly asked. I started to feel a little bit upset and to think. this man was trying to convince me, that I was not a painter. He was still staring at me, this time as though he wanted to convince me I was not living at all! He looked quite surprised, but without any hesitation he offered his hand. I know that one might think „I am dispersed“. Perhaps i am. But the fact is, I cannot always paint the same stuff, in the same colours and in the same style. I get bored very rapidly, I need perpetual change. I have no pretention to be called an artist if this demands one to stay blocked in a certain working style. I just want to paint, whatever and however I LOVE. Before they left they admired the tiger-striped wooden drain cover that Kevin had made to prevent the bad smell coming as a result of the torrential rain two weeks ago. The painter said. I thought: what an indirect compliment to MY work! I just had a look on his site. Our visitor really IS a famous painter. I will send him a christmas mail, so that we all may celebrate the birthday of the red-bearded green Jesus!